The Philips Respironics’ Nuance & Nuance Pro Nasal Pillow CPAP Masks with Gel Nasal Pillows use the first ever gel nasal pillow in a breakthrough design. The mask incorporates the comfort and contour of gel into a gel nasal pillow. Select the Nuance Pro to experience the first silicone frame with gel pads or, select the Nuance for a soft cloth mask frame. All three sizes of gel nasal pillows are included with both versions of the mask. 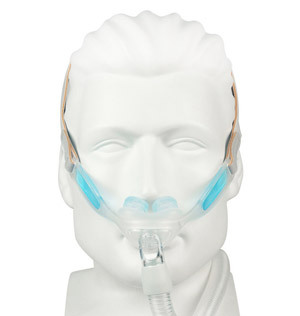 The Nuance & Nuance Pro Nasal Pillow CPAP Masks with Gel Nasal Pillows are the first of a kind in nasal pillow masks. By using the gel technology Philips Respironics pioneered in a lightweight and minimal nasal pillow design they offer a new dimension in comfort and seal. The gel nasal pillows fit two frame designs, offering a choice of a fabric or silicone frame. The Nuance Pro uses a clear silicone frame with gel pads to cushion the cheeks. The Nuance uses a soft cloth mask frame for lightweight comfort. Both come with all three sizes of gel nasal pillow. 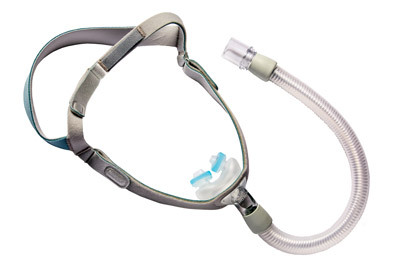 This is a nasal pillow CPAP mask and covers only the nares or nostrils, delivering air directly to the nasal cavity. The gel nasal pillow from Philips Respironics, the industry leader in gel mask technology, is designed to comfortably seal at the opening of the nose to deliver the therapy pressure. The gel ring is very soft and flexible to conform to the shape of the nose. All three sizes of the gel nasal pillow come packaged with both models of the Nuance letting the user select the optimal size for fit and seal. To extend the life of the mask, replacement pillows are available for purchase. 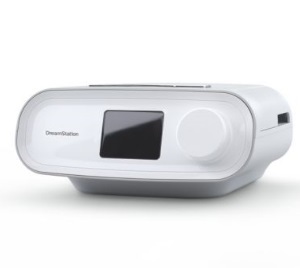 Philips Respironics offers the gel nasal pillow on two different frame formats allowing the user to choose. The headgear for each frame format is designed to support the gel nasal pillow seal. Select the Nuance or Nuance Pro when ordering to the get the desired frame and headgear. Read below for more information about the differences between the two options. The Nuance Pro frame is made of flexible clear silicone. It includes gel pads at the cheek area of the frame to cushion the area. The gel pads are permanently attached to the silicone frame and cannot be removed. The headgear is designed with Velcro closure tabs which attach to slots in the silicone frame. Please Note:The silicone frame with gel pads used with the Nuance Pro is not compatible with the Nuance headgear. The Nuance frame is made of soft and flexible fabric that is lightweight. 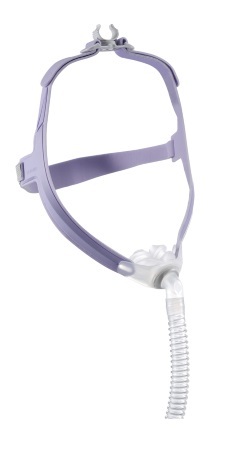 The gel nasal pillow is secured in place on the frame with a built in retaining ring. The Nuance frame Velcro tabs connects to the headgear at connector loops attached to the crown straps. Please Note: The fabric frame used with the Nuance is not compatible with the Nuance Pro headgear. The Nuance and Nuance Pro short tube is highly flexible and lightweight. It creates a buffer between the long hose and gel nasal pillow allowing for movement during sleep without disrupting the seal. The end of the short tube includes a swivel allowing the long tube to turn without torquing the short tubing. The tube is attached to the pillow cushion platform which is inserted into the opening of the frame. The gel pillow easily attaches to the pillow cushion platform. 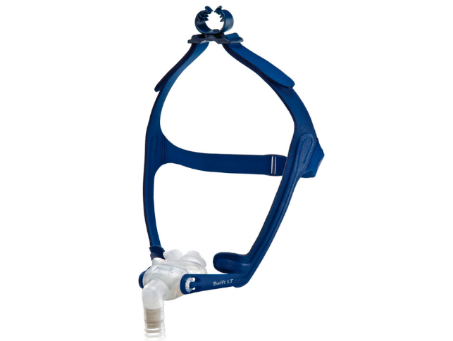 The headgear used with the Nuance and Nuance Pro have a built in hose loop at the crown. If desired, the short tube can be routed up and over the top of the head to keep the hose out of the way during sleep. 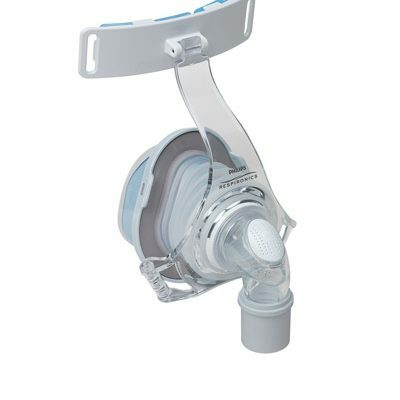 The elbow connection used by both the Nuance and Nuance Pro feature micro exhalation ports to soft and quiet the exhalation stream. The ports are angled towards the short tube. Therefore, if the tube is routed up over the head and secured with the headgear loop the exhaled air will be aimed upward and if it the tube is routed down over the chest the air exhalation will aim toward the users body. The Nuance and Nuance Pro are lightweight masks with just 4 parts making them easy to maintain. The masks easily come apart for cleaning. The nasal pillow design means no forehead support to obstruct the view allowing the user to read or watch TV while preparing for sleep. The small and lightweight Nuance and Nuance Pro can easily be packed for travel without fear of breaking a brittle mask frame.